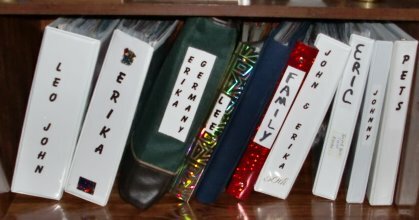 In 2011 my brother agreed to store the family albums I spent months making. I made it clear that I own the albums but intend to share and let others borrow them from time to time. I asked him what would happen if he gets mad at me in the future and his reply was "I would never do anything to those albums or not give them back to you. This here to me is an heirloom, so if you ever come back and want it, you can have it. I can store it at my house" Soon after he backed out of a different promise regarding estate land, I said I can't count on him to take care of Tippy while I go to Europe, I cancelled the trip, he lacks integrity and we need to talk. He got mad and disowned me (again), so I asked for the albums back until he decides to be more like family. That's when he destroyed them in large part and disrespectfully dumped the partial remains off at the probate attorney's office. He dumped the most precious family heirlooms off in the office of an attorney with a suspended license! Lee ended up with most of the album material. The Will states that we were to divide it 50/50 excluding what we each owned outside of the estate. Since I was in charge of the estate albums at that time (I lived on site and was the organizer), I handed him over half to include all his photos to make his own albums as well as many prints I made on my dime. The ones he stored for me were mine that I made. He stole much of the material from those. This should be a heads up for you when dealing with him. I always speak the truth, have a great memory, am level headed, reasonable, highly educated, ethical, honest and this is exactly what happened. Much information on how he intentionally mishandled the estate is and will continue to be public record in the Ashdown courthouse.